The Stingray is an all-in-one smart mixer utilizing Phoenix’s proprietary distributed array technology. 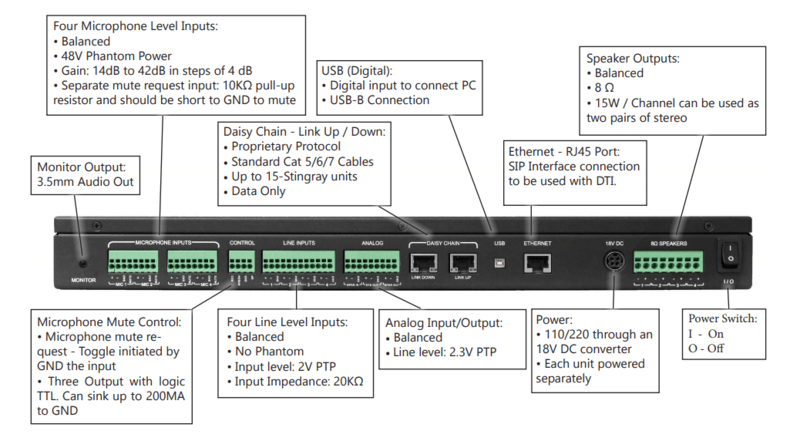 Each unit mixes up to four microphone inputs, performs echo canceling, noise canceling, AGC, and other algorithms required in a conferencing room setup. The Stingray also supports four auxiliary inputs that can be reinforced for local playback. Each unit comes with four 15 watt speaker amplifiers, SIP, USB, and analog interface, supporting any kind of conferencing device. *The Stingray can receive the mute request from any of the microphones and will mute the entire room.